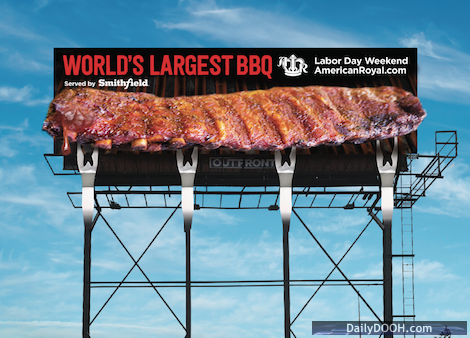 OUTFRONT Media has announced a new campaign with The American Royal, the largest BBQ competition in the world, to deploy a billboard featuring giant inflatable ribs dripping sauce onto a car sitting below the advertisement – a truly mouth-watering and eye-catching sight for passerbys! The billboard prop, which is 50 feet wide by 8 feet tall by 2 feet wide and promotes the iconic Kansas City competition taking place August 31 – September 3, was unveiled this morning and will remain up until August 20. Organizations like American Royal are working with OUTFRONT Media to revamp the traditional billboard and leveraging these 3D props to garner even more attention. This entry was posted on Monday, June 26th, 2017 at 19:54 @870 and is filed under Scuttlebut. You can follow any responses to this entry through the RSS 2.0 feed. You can leave a response, or trackback from your own site.